21st March and the start of our 2 whole days in Port Elizabeth. We were staying in a backpackers called 99 Miles Beach Lodge who had mixed up our booking a little bit which resulted in us getting a free upgrade to a double en suite room for free- result! So our time here got off to a good start. Day 1 and we were booked onto a 1/2 day township tour called ‘The Real City Tour’ with a company called ‘Calabash Tours’. Nelson was our tour guide and had grown up, and still lived in, a township in New Brighton so he was super knowledgeable about everything, passionate but not in a cringe way. He first gave us a tour of PE CBD pointing out all the historic sites from pre-colonial, colonial and apartheid days. Whenever he mentioned Mandela, he shouted his whole title (Baba Rolihlahla Dalibhunga Nelson Mandela kaMphakanyiswa Gadla kaMadiba) and hit his fist on the ceiling of the car in celebration. He was 18 in 1994 when the first democratic election was held and he voted for Mandela. So to the townships…a corner stone of Apartheid was the segregation of people according to race, especially whites and blacks. The government uplifted Black people from the areas they had classified as white only area in Port Elizabeth and dumped them in areas outside of the CBD called townships. There families were given no compensation, only a piece of land with a brick-built o uthouse toilet with a rubber bucket inside it. No drainage, no electricity and a single tap for water for a whole wave of families. With no building materials, these families built shelters out of whatever they could find, hence the metal/wood shacks that are now synonymous with our image our ‘townships’. In between the white and black areas were large bits of land which were left undeveloped- known as ‘Buffer Zones’. 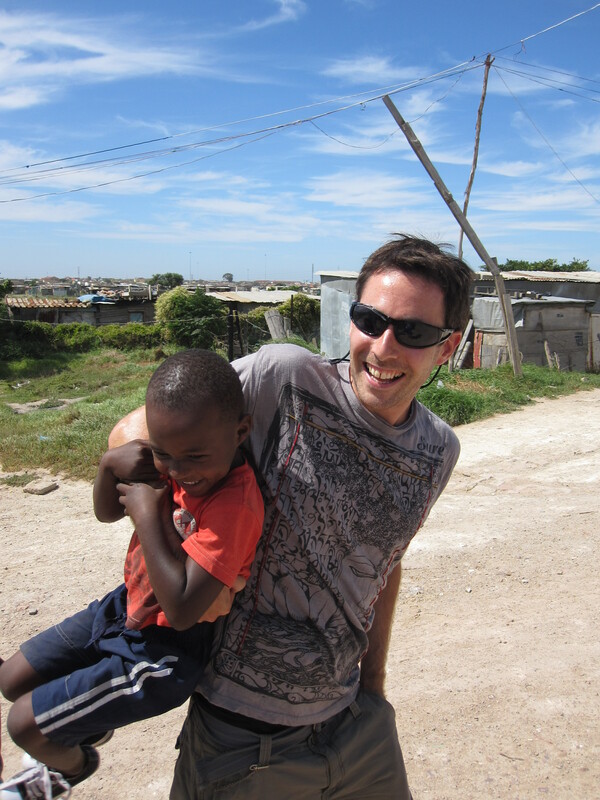 PE has 10 townships which are still home to 500,000 people. Apartheid policies are now abolished but choice and finance are the new barriers to integration. Black people are unlikely to afford a house in a previously white only area; and even if they did have the money many prefer living in the townships near friends and family. We visited the 7 oldest townships in PE including New Brighton, Kwazakhele and Zwide. They were all different. One which had now emerged as a middle class area where the township now looked like a UK housing estate. Some townships where the shack houses had been replaced with single storey brick buildings with drainage and electricity. But there were still plenty where families still lived in shacks without sanitation and electricity. The government have a housing programme target of replacing all the temporary shacks with brick homes by 2020. As Nelson took us to a view-point overlooking the sprawling townships, I couldn’t help feeling that achieving that target was optimistic. We drove through Embizweni Square which is an informal business hub in the tow nship area, full of lots of little shipping containers from which locals run their business from. This was the place to come for a haircut as there were loads and loads of salons and barbers! It is here were you can also pick up a ‘smiley’- a sheeps head which the ladies on the street boil and then cut in half for their dinners to eat! The sheep once boiled looks like it is smiling at you whilst your eating it, hence the name. Needless to say it looked gross! Just off the square we stopped off at a ‘Shebeen’- what was an illegal drinking house during the Apartheid years. The Apartheid government banned black people from selling alcohol so people used to just go around to someones home and buy and drink socially there. Nelson bought us a drink at the former Shebeen, now called the Ship Inn, before we headed to our final stop at the township called Ramaphasa Village to visit a community arts and craft project. Hedd made a new friend with a little boy who lived next door who mocked him on his little arm muscles but still demanded Hedd pick him up and spin him around lots of times. It was a mix of cute and funny to watch! It was also here that I experienced first hand ‘Township Dust’. PE is so windy and the paths in the township are unsealed so as a big gust drove through the township a load of dust threw up and landed in my left eye. Man it was painful! So we ended the tour me half blind, but both agreeing it was well worth it. After a chilled out morning on our second and final day in PE, we got picked up from our hostel for our ‘Tooth and Claw’ Game Drive at Schotia Private Reserve. It was a 40 minute journey to Schotia and my goodness what a 40 minutes. We had got picked up by the reserves owner called Peter and initiated by him we were treated to intense discussions about post apartheid South Africa and his stance against positive discrimination and then his views on how to solve Rhino poaching which involved the decriminalising ivory selling to rid the black market! I did my best to passively umm and nod and we both breathed a sigh of relief when we arrived and were able to get out of the 4×4! 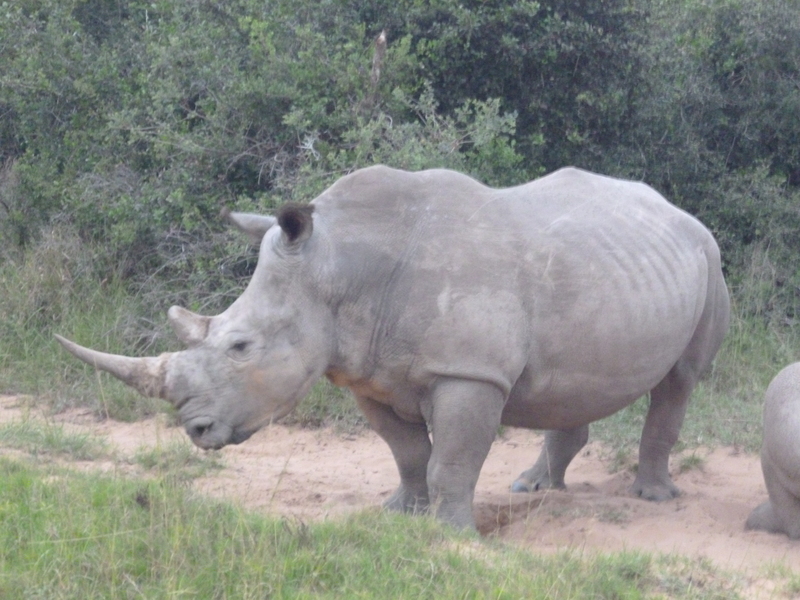 So Schotia Safaris- a privately owned and managed reserve, owned by the Bean family since 1833. The oldest private game viewing reserve in the Cape Province, it was also the first to have lions that can hunt for themselves. Its well stocked with over 2000 animals and over 40 species on the reserve. Our ranger was called Malcolm and as we drove off from base and through the gates of the reserve we both admitted to humming the Jurassic Park theme tune in our heads! 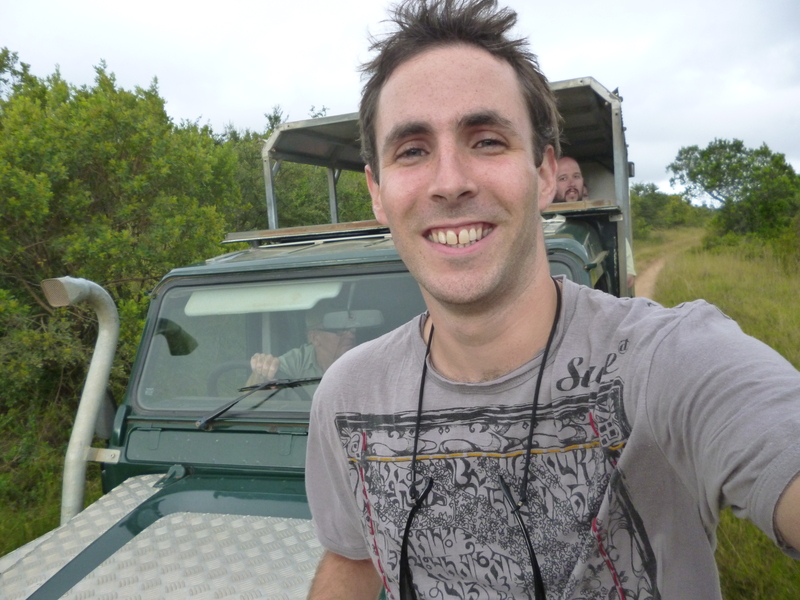 We had 2x 2 hour game drives with a tea break in the middle and then a bush dinner afterward and we saw loads of animals. 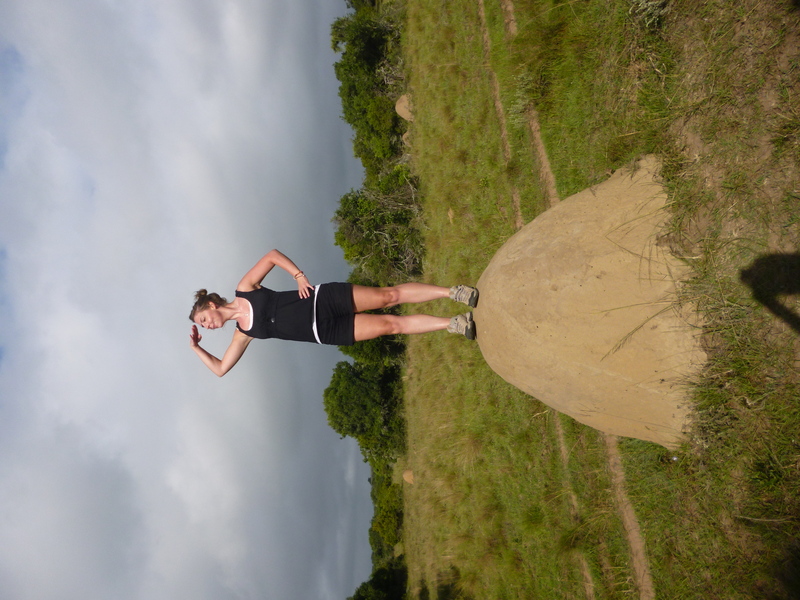 Lions, antelope, giraffe, vervet monkeys, zebra, rhino, hippo, warthog, kudu…. The park is split 1/3rd, 2/3rd’s to keep the rhino and lions separate so the lions don’t eat them and in the ‘no-lion’ part Hedd and I got to ride on the seat mounted outside of the 4×4 on the bonnet. When Malcolm first offered it to me I though he was pulling my leg but it was perfectly safe and I got to see the zebra really close up and Hedd the giraffe. It was amazing to be out of the 4×4 in the open air so close to the animals. Back in the 4×4 and I was busy ticking off all the animals we’d see n on the checklist Malcolm gave us, and having worrying exchanges with Hedd at the fact that we had eaten some of them (kudu, ostrich…)! Which was only reinforced come tea time at the open air lapa in the middle of the park, where we were served roast springbok! Ah well, we’re carnivores after all! After dinner we had another 30 minutes of night viewing to get a glimpse of nocturnal creatures. It’s also the best time to try to see a ‘kill’. Although we saw lions, they looked ready for bed rather than hunters at the ready so we settled for the sights of porcupines and hares as we drove back to the main gates. 4 1/2 hour game drive, a lovely dinner and a great guide in Malcolm; Hedd and I felt like we’d got great value for money and it definitely wet our appetite for our 4 day safari we were planning on doing in Chobe National Park, Botswana, a couple of weeks later. 6.30am pick up by the Baz Bus for our 7 hour journey to Port St Johns on South Africa’s wild coast. As we travelled further East we began to see a dramatic change in the landscape and feel of South Africa. Whereas the Garden Route was pretty westernised, the Eastern Cape was far from it and from Port Albert we were travelling the Transkei. 1.5-2.5 thousand meters above seas level, stray animals wandering the road and town after town where we saw no white faces apart from those travelling in the bus. 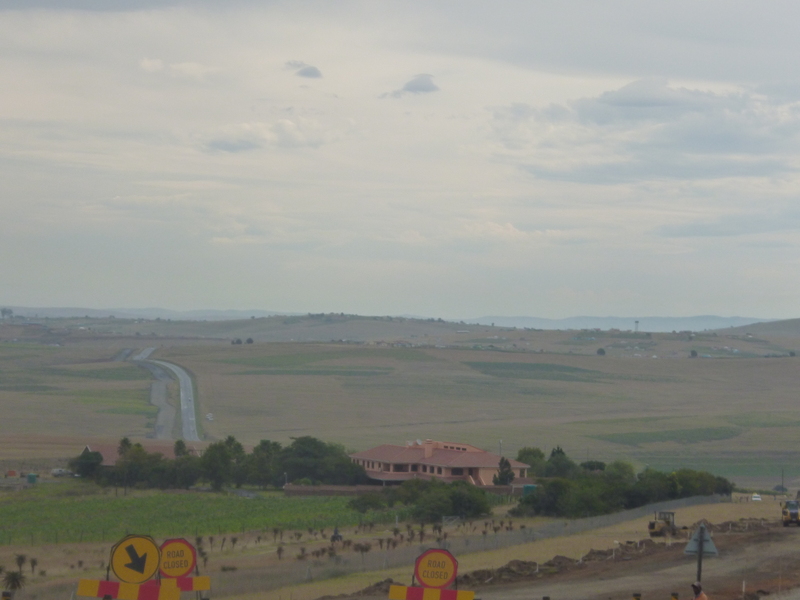 This was one of the most scenic parts of South Africa but also the poorest. The Transkei was an independent country before 1994. Known as one of the ‘Homelands’, the Apartheid Government gave the corrupt government of these tribe based countries too little money to run the area. That plus their rurality resulted in the Homelands such as Transkei falling behind other parts of SA economically, leaving them the poorest part of SA after 1994 when Mandela abolished the homelands creating 1 nation 1 president. Mandela was born and brought up in Transkei and we drove past the villages where he was born and brought up. By the side of the road there is also the big house that the ANC gave Mandela at his r etirement from government. It is within the grounds of this house that Mandela requested a replica to be built of the prison cottage Mandela was held in under house arrest after he was moved from Robben Island, and you can see it from the road. Mandela still to this day says that this cottage is the best house he has ever lived in! As we completed our drive through this rustic outcrop of SA with its sparse villages of thatch roofed huts, seemingly in the middle of nowhere, we reflected how unlikely yet magical it was that this area grew such a powerful leader as Nelson Mandela. We got dropped off at a random Shell garage in a place called Mthatha by the Baz Bus and then picked up by our shuttle to take us to Port St John on the coast. We soon realised however that this shuttle bus was not exclusive, and it took us 2 hours to make the journey to the coast as we picked up and dropped off lots of different people along the way! We stayed at Amampondo Backpackers on Second Beach at Port St John and it was much more rustic accommodation than we were used to in SA- mud floors and walkways, bamboo outdoor bathrooms…rough and ready but after a little getting used to, we were game! 24th March and we woke up to torrential rain. Our plan to go for a hike and then to the beach were de-funked so we had a lie in, a bamboo shower and lazed the day away at the covered (fortunately!) bar. We soon got invited to join in a board game called 30 Seconds- a South African version of Trival Pursuit vs Articulate. Needless to say Hedd and I struggled, on average only knowing what 3 out of the 5 things on the card were that we had to then try to describe to our team. Who knew there were so many different South African cricket/rugby captains! Our last morning in Port St John and hoorah no rain! We ventured down the muddy path to Second Beach and it definitely lived up to its name- ‘wild’. 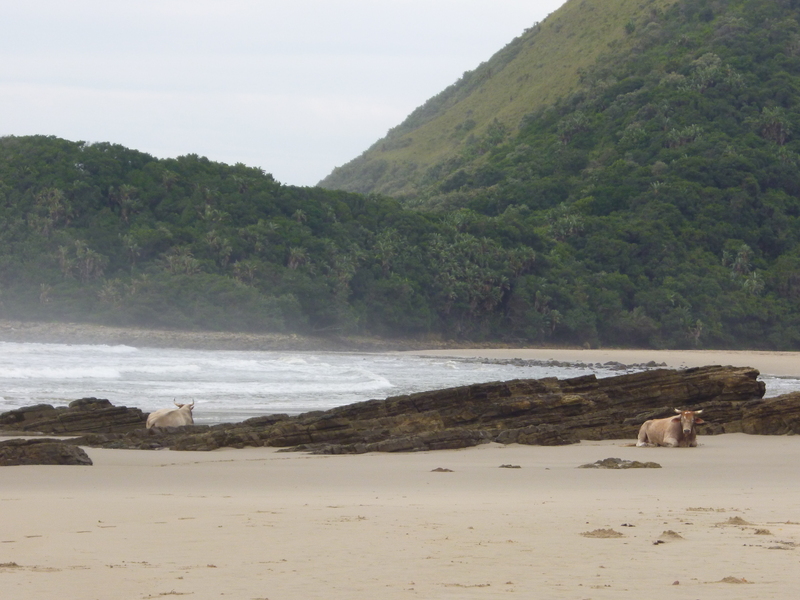 Rocky cliffs, noisy waves breaking and 2 massive cows with horns just sitting on the beach minding their own business. After mooching about on the beach and having beans on toast for brunch it was time to leave on our crazy shuttle bus back to Mthatha. It again took us 2 hours, picking and dropping off people seemingly from and to the middle of nowhere along the way! But we got to the Shell Garage pick up safe and sound and in good time to catch our Baz Bus connection to Durban. I had good intentions of catching up on my diary writing but I abandoned that and just watch the amazing landscape through the frame of my window. Transkei is truly beautiful; valleys and mountains like grass topped versions of Table Mountain everywhere plus the best pink and orange sunsets. We even got to a see a Transkei special of a horse all saddled up galloping down the middle of the road, parting the traffic like an emergency vehicle as it went. Goodness knows where its rider was! 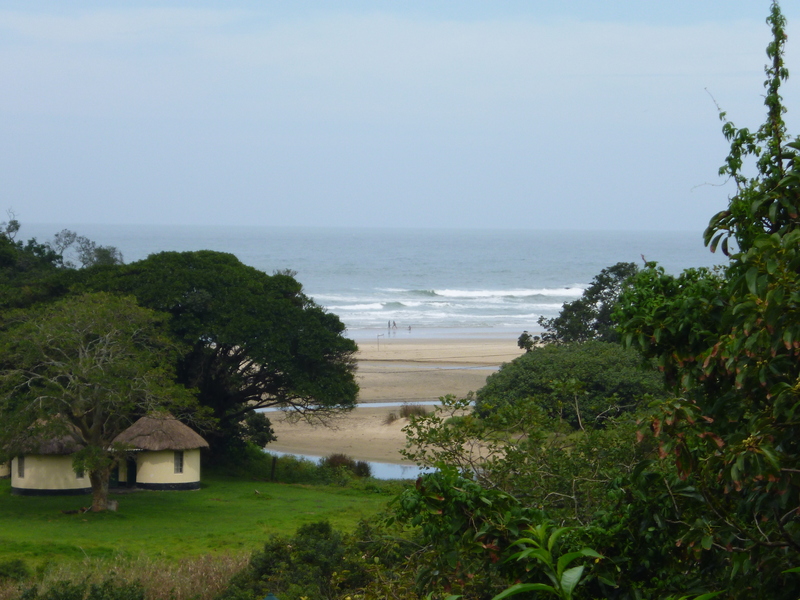 7 hours later, leaving Transkei and entering Kwazulu-Natal province, we eventually arrived in Durban at 10.30pm. Good to no-one at 10.30pm, we crashed into bed at our hostel Hippo Hide looking forward to our tour into Zululand the next day. Food= A student diet of beans and tomato pasta! I really enjoyed this section of our trip. We’d had fun in Cape Town and fun along the Garden Route, but this part of the trip while also fun was more culturally rewarding. We learnt so much more about the real South Africa today. We saw how some white South African’s (namely the owner of the Game Reserve) were unhappy with the Black Economic Empowerment programme designed to increase the upward mobility of black South Africans in the country. The owner of the Game Reserve was adamant that it was impossible to say that everybody in South Africa is equal while this policy was in place. Personally, given the history of the country and the fact that segregation still exists in the form of economic segregation (the majority of white South Africans are wealthy and the majority of black South African’s are still poor) then the policy has merit. 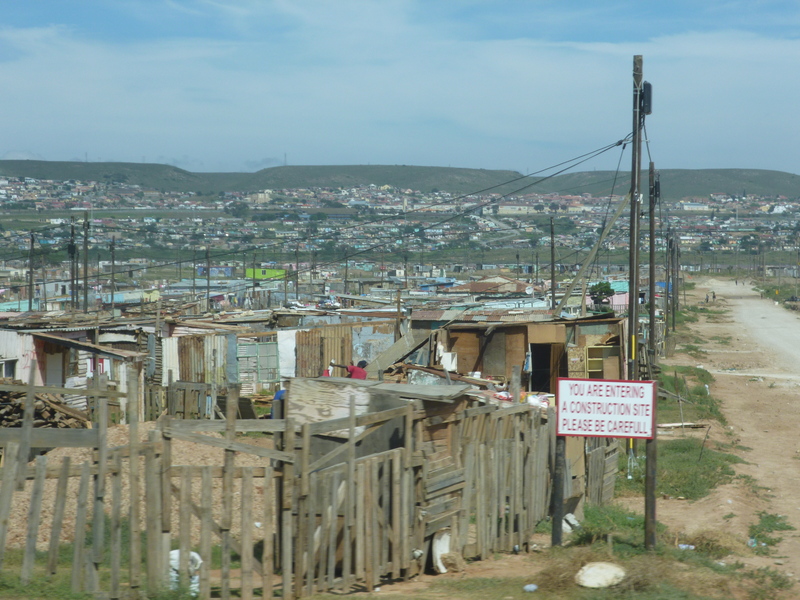 We got a glimpse of the real difference in Port Elizabeth as we left the predominantly middle class area where our hostel was built and went to visit some townships and informal settlements. The difference was staggering. Our guide was fantastic and gave us a real insight into these communities, he would almost explode with joy when shouting out Nelson Mandela’s name and praised the government for their programme of upgrading the townships. The task is massive, and will never be complete by the government’s deadline of 2020, but progress is being made and that is positive.